The betrothal gifts are delivered up to a month and at least three days before the wedding day. The groom and a friend or a matchmaker will deliver the gifts on the auspicious date chosen. betrothal jewellery from the groom’s parents to the bride. Cantonese will have the dragon and phoenix bangle 龙凤琢 and the teochew four items of gold 四点金. Some people also call the bride’s price "bride's dowry". It is either pre-agreed during the wedding negotiations or the bride’s parents may leave it to the groom’s side to decide. 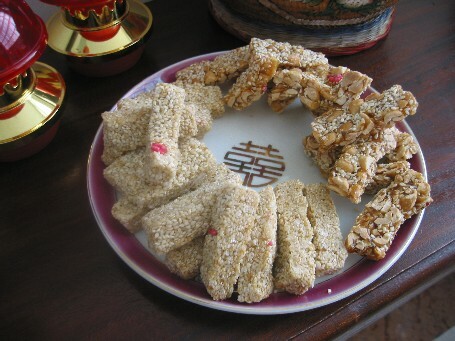 It is usually presented in a red packet or wrapped in a special red cloth. Even amounts are presented. For average income families, $600 to $2,000 are commonly given. The groom’s side will usually prepare slightly more than the pre-agreed amount. the two families will share their good fortune. For example, the groom may present a red packet of $1,200; the bride’s parents may keep $800 and return the balance in the red packet. Some will include the bride’s price with the betrothal gifts whereas some will only present it when the groom fetches the bride on the wedding day. 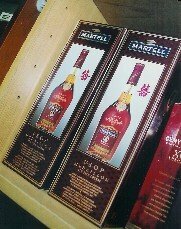 In the return gifts, the bride’s parents will replace the 2 bottles of brandy with 2 bottles of orange syrup. An even numbered portion of all the other gifts are returned to the groom’s family together with the 2 phoenix candles. 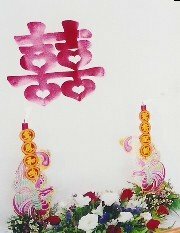 The bride’s side will light the 2 dragon candles and the groom’s side the phoenix candles on the morning of the wedding day. Some hokkien family will also request for a bunch of bananas and red dates to be included in the return gifts. A red packet for the groom’s parents to buy shoes is required. This is similar to the wedding shoe custom practised by the Naxi minority [纳西族] living in Lijiang [丽江] around the Sichuan [四川], Yunnan [云南] area. The bride will also present towels to the parents, grandparents, aunt, uncles and groom’s siblings. Decorate all packaging of betrothal and return gifts with red double joy stickers. The bride’s parents may deliver the dowry together with the return gifts on betrothal day or may deliver the dowry on another day. After the betrothal, the bride’s parents will distribute the chinese wedding invitation for the wedding banquet to their relatives and friends. For economic purposes, wedding cakes are usually limited to close relatives and friends only. Likewise, after the betrothal the groom’s parents will either distribute the chinese wedding invitations to their close relatives and friends together with some wedding cakes.